I could have chosen a more horrific image to begin this story, but there is just something about this girl's face that I simply cannot look away from. Here, caught on film, is her rescue from a gruesome end, and yet her look is resigned. It seems to say, "oh well, another day in hell, what is the difference?". 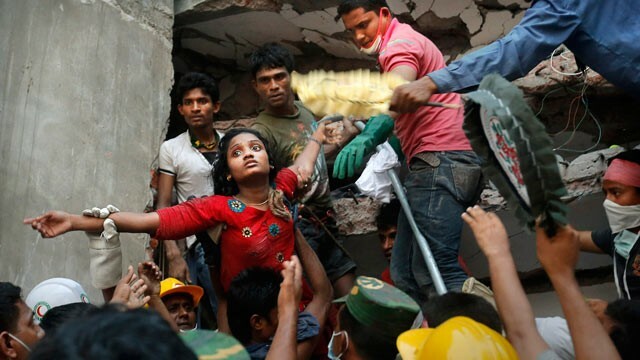 I hope that whoever is reading this know's about this picture, where it was taken, what happened that day at Rana Plaza in Bangladesh. I hope we have at least come that far. But it is a strong possibility that many Americans are not aware that over 800 (and counting) ordinary people went to work one day and died, all at once. The story is so horrific that it is hard to process. That outfit you are wearing today, that you bought somewhere you probably forgot by now, might have been made by this girl's hands, or the hands that lay, severed from their owner's bodies, in the stinking and rotting pile they are yet to be dug out of. This is real stuff. Real lives shattered. Real suffering. A couple weeks ago 3 people died in the Boston Marathon and it was a national tragedy. Indeed it was. But what about all those people on the other side of the world who are literally your slaves to fashion. Your slaves and my slaves. This blog will document my personal process of literally cleaning out my closet for the good of humanity. One by one I will be examining every item of clothing I own, documenting where it was made and by whom. Once this process is complete, everything that I own that was potentially made at the cost of human blood, will be burned in their honor. I know it's really silly isn't it? Why shouldn't I give them all away, why such waste? My answer to that is simple; my wardrobe has defined me for my entire life. Everything I wear I treasure. I can tell you where I bought it and many stories about where I was and what I was doing when I wore it. My history can be told through my clothing. Just as these people's history is being told through my clothing. It is the only thing I have to offer them. This is my sacrifice, my honor to them. May they rest in peace. Hi Deb, you had come by a blog post I'd written about sweatshops and you left a comment a while back, and, shame on me, I didn't manage to reply. So here I am, finally! I wanted to thank you for leaving a comment at No Signposts in the Sea, and wow, your blog is a fascinating read. I mentioned your blog in my latest post, and I hope that some of my readers will stop by at your site. I'll definitely follow your journey from now on. Oh wow, that is such an honor, thank you so much!